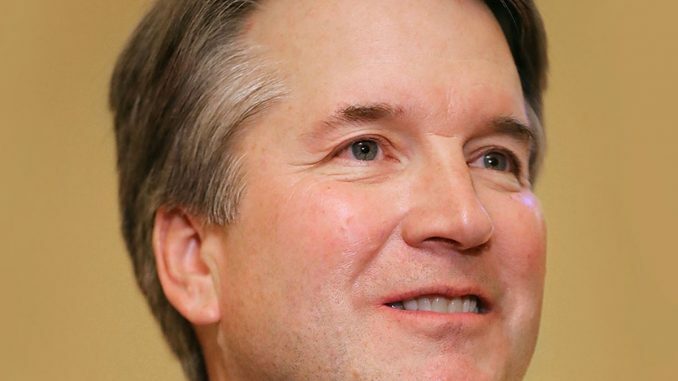 HomeNewsNorth AmericaAll 34 Official Nods For Brett Kavanaugh Were By Men. Here’s What 34 Women Think. All 34 were by male senators and representatives. None were by people of color. If confirmed, Kavanaugh — who currently serves on the District of Columbia’s U.S. Court of Appeals and is one of the authors of the infamous Starr Report — will replace Justice Anthony Kennedy, who is slated to retire later this month. While he’s more likely to get confirmed than not, Democrats are not going down without a fight. Reproductive rights, LGBTQ rights, workers’ rights, and more are at stake. Reproductive-rights advocates are especially alarmed that last year, Kavanaugh sided with the Trump-Pence administration, saying it could continue to block a 17-year-old undocumented young woman from obtaining an abortion. In his dissent, Kavanaugh wrote that the court was giving a new right to “unlawful immigrant minors” to obtain an “immediate abortion on demand,” a phrase that is popular with the anti-choice movement. Equally alarming to many was his argument that sitting presidents should be exempted from civil suits and criminal prosecution — a pretty obvious reason for the embattled administration to have picked him. The White House continues to show that it doesn’t want women to have a seat at the table when it comes to making decisions for the country. Among the 34 testimonials, it strangely didn’t even acknowledge women from its own party who support Kavanaugh’s nomination. By choosing all white men to speak on behalf of the entire country, the Trump administration is once again reaffirming its commitment to white, male supremacy (while paying only the faintest of lip service to women’s empowerment). Kavanaugh himself is the latest in a long line of white, male justices: Of the 113 Supreme Court justices in history, 107 have been white men. That means in the court’s whole 228-year history, only 5.3% of the justices have been women or minorities. Change will come one day. But for now, we followed the advice of Shirley Chisholm: They didn’t give us a seat at the table, so we brought a folding chair. And since white men comprise a disproportionate number of voices in our government, we’re going to make sure women’s voices, voices of people of color, and LGBTQ voices are heard. Ahead, 34 women — from all political affiliations — speak out about the Kavanaugh nomination. “Two decades after Brown v. Board, I was only the second class to integrate at Berkeley public schools. Without that decision, I likely would not have become a lawyer and eventually be elected a Senator from California. That’s the power a Supreme Court Justice holds. “Women, people of color, and so many other marginalized communities deserve a strong voice, not someone who has the power to destroy critical wins on women’s reproductive rights, healthcare, marriage equality, unions, and civil rights at the drop of a hat. “The Supreme Court vacancy is the most consequential in our lifetime, but this nominee is from an A-list of extremists, out of touch with reality.